WordPress is one of the most popular Content Management System used by web developers. It was released as a blogging platform but now it is being used to create any kind of website. WordPress is used by most of the bloggers and also by many popular websites including Mashable and Techcrunch. Main reason behind the popularity of WordPress is that WordPress is free and opensource. As it is opensource, many developers support this and release free plugins and themes. So, we can design a good website with these free themes and enhance the functionality with free plugins. There are some premium plugins and themes marketplaces are also available which provide best themes and plugins if you need. As we know that WordPress and its themes are available for free, there are so many websites available that offers free WordPress Tutorials. WordPress is popular, this is the reason it can also be a good career option. You can also learn WordPress to work on your own blog. If you are planning to learn WordPress, you should learn how to customize WordPress and perform basic tasks like installation, changing theme and SEO optimization In this post, I am listing few best websites that offers good quality WordPress tutorials. These are few blogs that offer awesome WordPress tutorials for free. You can start learning WordPress from these websites. Wpbeginner is a popular website that provides free WordPress tutorials. This blog was founded by Syed Balkhi and now it has a team of dedicated authors who write quality articles on WordPress. This blog also covers everything related to WordPress from installation to troubleshooting. SiteGround also has a section that covers everything related to WordPress. All posts covers basic and are best for beginners. If you are thinking to learn WordPress, you can read these awesome tutorials. The best thing is that the tutorials are properly categorized. So, you will get step by step guides. Wp Tuts+ is another nice website that you can try to learn WordPress. This website is the part of Envato, company that provides best web development resources. 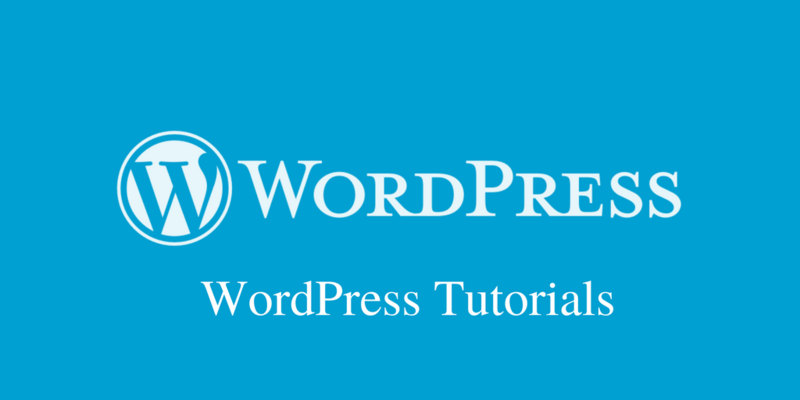 Wp Tuts+ covers tutorials for all kind of WordPress learner. Either you are beginner or expert, you will find this website useful. If you are looking for video tutorials related to WordPress, Lynda.com can help you a lot. You will find video tutorials covering most of the WordPress related issue. You will learn from installation to troubleshooting. Wphub is another popular online WordPress tutorials collection. This website provide free WordPress tutorials, themes and plugins. Some premium services are also available. You can also get hosting and themes discount along with WordPress tutorials. Quick Web Resources is another nice website that covers most of the WordPress related issues and tutorials. It is basically a blog on web design and blogging tutorials. WordPress is a core part of blogging and web design both. So, there are more than 150 tutorials of WordPress on the blog. Disclosure: Deepanker Verma, who writes on Use This Tip is the owner of Quick Web Resources. SitePoint is another popular blog that covers most of the things related to WordPress. If you are looking for best WordPress tutorials, you should surely visit the website. First Site Guide is also another nice online resource to learn WordPress. This website not just covers WordPress but they also have tutorials on other blogging platforms and web design languages. If you can learn from code manuals, WordPress Codex can be a good choice. This is the official user manual for WordPress and covers most of the WordPress functions. It also explains how to use a function and what parameters it requires. If you are learning WordPress development, this should be in your bookmark list. WPMU Dev updates their blog weekly with useful WordPress tutorials. They offer in-depth guides on WordPress related things. Not just tutorials, they also offer several free and paid plugins to improve your WordPress experience. This is one of my favourite websites for WordPress Tutorials. WP Mayor is also a notable website for WordPress tutorials, hacks, plugins and reviews. This Website also covers in-depth WordPress tutorials. If you are learning WordPress, keep visiting this as well. WpKube is another WordPress tutorials website that has lots of Tutorials on WordPress, plugins, themes and hosting. This website gets regular articles covering everything related to WordPress. Elegantthemes is a popular WordPress theme company. They have a dedicated blog talking about WordPress, themes, tutorials and plugins. They not just promote their own plugins and themes but also offer in-depth WordPress guides. Smashing Magazine is a web development dedicated blog covering lots of topics. It has a WordPress Category that offers lots of interesting WordPress articles for beginners and expert people. They have covered most of the things related to WordPress. If you are looking for WordPress tutorials and guides about plugins and themes, ManageWP Blog is for you. They regularly publish interesting content about WordPress. Hongkiat is a popular tech blog that also covers web design and WordPress. On its WordPress section, you will find interesting articles on WordPress management and development. They have good contributors offering in-depth guides and tutorials on WordPress for coders of any skill level. WPLift is also a dedicated blog providing interesting articles, guides and tutorials on WordPress WordPress. They also got a section for deals and coupons to save few bucks on themes and hosting. WPExplorer is also one of the good WordPress related websites. It covers WordPress tutorials, guides, themes and plugins. You can keep visiting this website or sign up for emails and get interesting WordPress tutorials. WPSquare is also a simile kind of WordPress blog that covers everything related to WordPress. It has awesome tutorials on themes, plugins and WordPress code. Shoutmeloud is a blog on WordPress and Blogging. It also has lots of interesting and worth to read WordPress tutorials. So, you should also add this one in your list and start learning WordPress. There are so many other websites are also available that covers WordPress tutorials and how to. So, I added few notable websites that have simplified quality tutorials. Not just basic tutorials, these website covers advanced tutorials including development, plugins and editing core files. If you know another website that must be in the list, share it with us. I will surely update the post and include your link. WordPress.org vs WordPress.com: What should you choose?